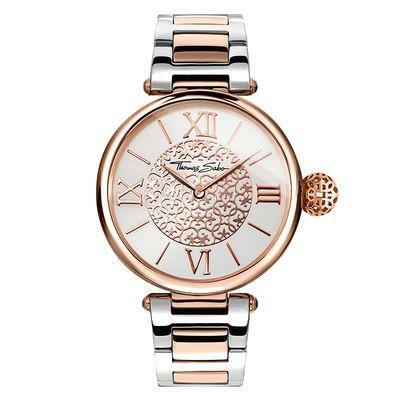 This striking watch by Thomas Sabo features a larger dial, with a delicate rose gold Arabesque pattern on a silver-toned sunray finish. The elegant strap is made from high-grade Stainless Steel with contrasting silver and rose gold toned links. The oversized crown of this watch is the perfect accent, with a delicate filigree orb design. This watch is waterproof to 5ATM. The case is 38mm in size.